Did you know people who rely solely on touch and no images feel a stronger connection to a product? It’s true, it’s been proven in a recent study on haptics (sense of touch). As someone who loves paper I wasn’t surprised to hear this, but it did offer an explanation as to why I gravitate towards papers with a tactile finish and nice heft to them. Show me a print sample featuring a blind emboss and there’s a good chance you’ll never see it again. Needless to say, I was a little woozy when I saw the new promotion about haptic design from Neenah Paper called feel think do. Designed by the team at Design Army and unveiled at HOW this year, this piece demonstrates the power of paper. From the moment I held it in my hands, I knew it was special. The cover alone is remarkable. Sporting a flamingo foil on the signature ‘N’ embossed beveled logo which pops on a beefy Classic Linen Red Pepper 100#C, made to feel doubly hefty by a french fold. As if this wasn’t enough, the title feel think do, jumps out at you featuring partial diecuts on the silver metallic letters which reveal a pomegranate foil from the inside of the french-fold peeking through. Then there’s the Amethyst Stardream wrap around the bottom that compliments the color palette beautifully and says everthing you need to know about what’s inside, “colors & textures – The Power of Paper (in a pomegranate foil). Did I forget to mention the miniature knockout arrow design within the silver metallic & diecuts of the letters? OMG, once again Neenah leaves me speechless, and this was only the cover. If mere touch leads to increased perceived ownership then I already know the papers and techniques I want to use for the next year. This piece is full of amazing inspiration on not one or two but ELEVEN different Neenah grades (I’m counting the grades as I write this). Yup, it’s 11: Stardream, Classic Linen, Environment, Clearfold, Eames, So…Silk, Classic Crest, Oxford, Esse, Plike and Classic Columns – phew. Moving past the aesthtics for just a second, the content about haptic design is really useful. 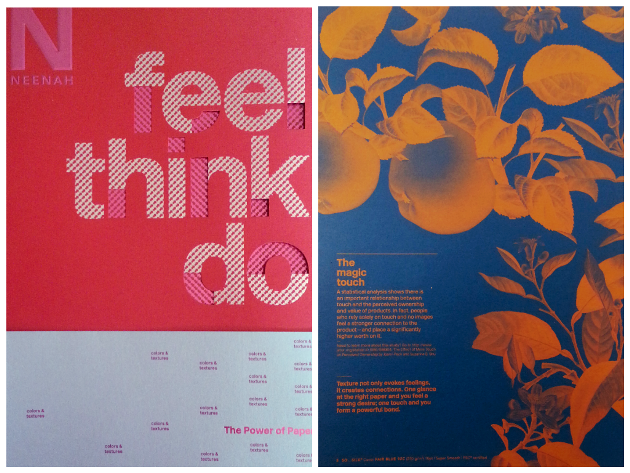 For example, advertisers used to believe the way to success was influencing the consumers brain, think>feel>do. Now we know consumers are driven by desire, it’s feel>think>do. 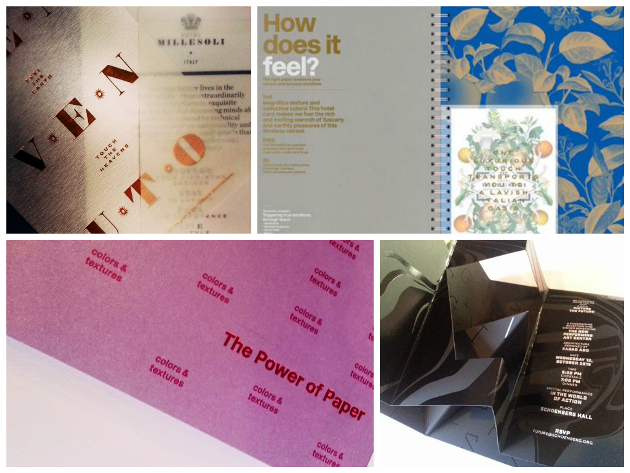 Feelings come from a luxurious touch (think gorgeous textured papers) and designers know paper has the ability to touch hearts, then change minds and inspire action. All I know is if this piece does not inspire you to use gorgeous, tacile papers when you design for print, maybe you should focus solely on web design. To learn more about haptic design sign up for our newsletter. And if you love what you see here, check out the subscriptions to The Parcel and get paper inspiration delivered to your door.